They are touring this year in support of their recently released album Hit and Run - Revisited, a new take on their most popular album originally released back in 1981.This show will brought back a lot of memories for me as the first major rock gig I attended was Girlschool at The Royal Spa Centre in Leamington in 1980 on the tour to support their first album. 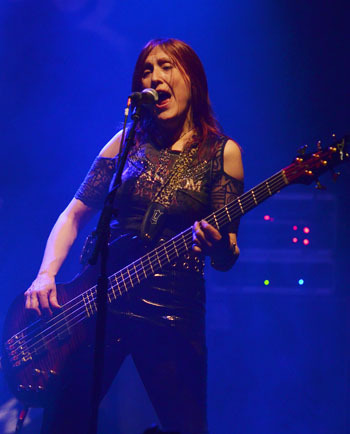 The fantastic show with support by the excellent Angel Witch included a dramatic moment when lead guitarist Kelly Johnson (sadly no longer with us) was pulled into the crowd, she was all smiles when she made it back to the stage though. I so much enjoyed the Spa Centre show and the Demolition album that in 1981 I remember going straight to HMV after my shift on Coventry Railway station and buying their second album 'Hit and Run' on its day of release and later that year caught that album's tour when it hit the Coventry Theatre. I continued to buy the bands albums and also the fantastic 'St. 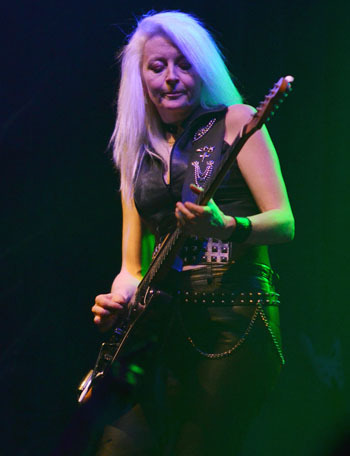 Valentine�s Massacre' EP where they joined Motorhead on three numbers including a rocking cover of the Johnny Kidd & the Pirates classic 'Please Don�t Touch'. 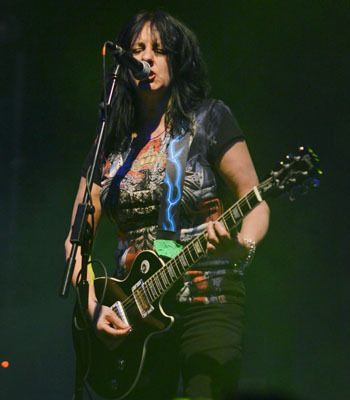 My next Girlschool gig was also in my local area, when they headlined the 2006 Napton Festival. Now - 32 years after they last played the town at The Royal Spa Centre - the band return as part of their 'Hit and Run - Revisited' trek. There was a full support card for the evening beginning nice and early with Leamington 3 piece outfit Uncle Tim playing a set with a grunge/indie rock vibe but also the occasional touch of doom laden rock, a well played and well received opening set. Next up another fairly local band Lost In Vegas hailing from Tamworth performing a set of catchy hard rock numbers full of great hooks, on certain numbers like 'Wash Away' they remind me of Black Stone Cherry, full of that band's power, in the catchy as you like 'Breathe' they have a gem of a track, killer guitar work (reminiscent of a certain Mr Iommi at times), and a knockout chorus, cracking set from a band to watch out for. Staying in the Midlands for the final support band ng26, a hard hitting Heavy Metal band based in Nottingham, a set full of crunching guitars and power packed at times tribal like drum work, added to all this power and giving the sound real layers, top quality lead vocals, strong vocal harmonies, and stunning lead guitar work. The band perform a selection from their debut album 'Open Your Mind' with one of the real highlights 'One More Road From Home' a high tempo rocker with lighting fast lead guitar work. 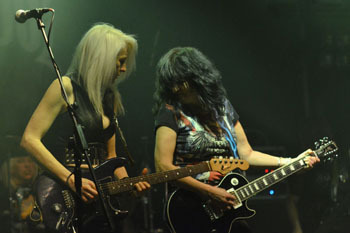 Wailing sirens heralded the long overdue return to the town of one of the true bastion's of female rock music, the mighty Girlschool and apart from the sadly missed Kelly Johnson the line-up is the same one that graced the Spa Centre stage back in the days when I was a young teenage rocker, Kim - guitar/vocals, Enid - bass/vocals, Denise - drums and new girl (!) 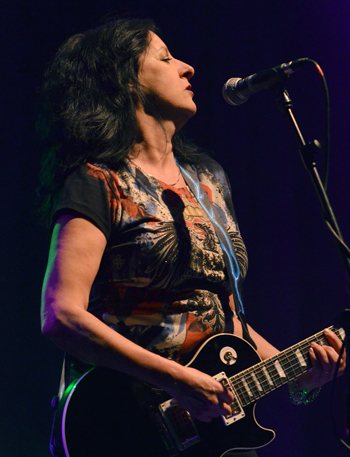 but with the band now for over 10 years, Jackie Chambers on lead guitar duties. The band on excellent form at this show with a set chock full of their short snappy rocking metal (with touches of punk attitude) crowd-pleasers, after the intro sirens it was straight to business with storming debut album opener 'Demolition Boys', next without a pause for breath it was the first visit to 'Hit and Run - Revisited' (the recent re-recording of their classic 1981 second album) with that album's opener 'C'mon Let's Go' (already a certain reviewer/photographer could not decide whether to take notes/photograph or head bang!!). The set was heavily laden with numbers from the first two classic 'New Wave of British Heavy Metal' era albums and from Demolition the main set had a spirited 'Not For Sale', the frantic 'Emergency' and my personal (and by the look around the crowd a lot of others) favourite number their stunning version of the Black Oak Arkansas classic 'Race With the Devil'. The Hit and Run album was also well represented including a pounding 'Yeah Right', the 100 miles an hour 'Watch Your Step' and the pop/metal cross-over title track itself, other highlights of the main set included 'Screaming Blue Murder' the title track of the bands third album and with it's knockout chorus 'Never Say Never' from the 2004 Believe album. The band seemed to be having fun all set, even Kim with her many guitar strap issues (sorted with her usual good humour), the lead vocals were as usual shared between Kim and Enid, Denise pounded powerfully away on the skins at the rear all set whilst Jackie supplied a series of magnificent lead guitar breaks, this was a high tempo/energy rock set without a ballad in site. Encores for the night, rocking and rolling early single 'Take it All Away' and the band's always fabulous take on ZZ Top's 'Tush' ending a set to please all the 40 something rockers in the audience and everyone else. 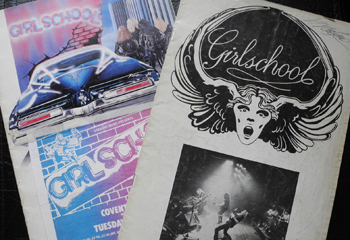 And for me it brought back sweet memories of a sweaty night in 1980, proudly wearing my denim jacket with numerous patches headbanging the night away.